Click the button below to add the Xendurance Josh Bridges' Creatine -JB 240g Lemon-Citrus Muscle Growth & Strength to your wish list. Josh Bridge's Creatine-JB uses only Creapure™, 100% pure, creatine monohydrate, enhancing uptake and bioavailability, thereby allowing your muscles to quickly absorb and utilize creatine faster. Creapure™ is a form of creatine monohydrate and is widely considered to be the purest and finest quality micronized Creatine Monohydrate on the market today, which is one of the reasons it's the preferred creatine for many professional strength, speed and power athletes. AlzChem AG, the manufacturer of Creapure™, uses a different manufacturing process for the creatine monohydrate which in turn ensures it's free from impurities and unnecessary by-products including Creatinine (CRN), dicyandiamide (DCD), Dihydrotriazine (DHT) and Thiourea. Creapure™ is more expensive because of the additional processes it goes through and is 99.99% pure creatine monohydrate, which is again, a reason why many athletes prefer to use Creapure™. Every manufacturer should unconditionally guarantee the certified production and documented purity of it's creatine. 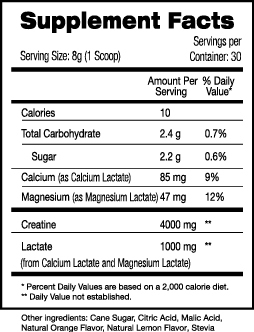 Creatine-JB is a unique formula as it also contains the body's preferred fuel, lactate. If you train on a regular basis, your body will choose lactate over glucose (sugar) as its energy source. With 1000mg of lactate in Creatine-JB, you will feel the increase in energy, increase in strength, size and power, and you will recover faster. Creatine can help support protein synthesis which helps muscle growth and every scoop of Creatine-JB gives you 4 grams of 100% pure, clean Creapure™ creatine and 1000mg of lactate. Creatine-JB's orange-citrus flavor is so refreshing and light it mixes easily with other liquids. This is why Josh Bridges mixes one scoop with Extreme Hydro-X for even better results. Based on the results of approximately 350 publications on the subject of creatine supplements in sports, creatine is recognized as an effective, performance-enhancing, natural nutritional supplement which is free of side effects. Taking creatine supplements allow the muscle cells to work for longer periods and at a more energy-efficient level. Creatine supplementation also reinforces carbohydrate loading to an extent that would be expected to significantly improve athletic performance. As well as building muscle in both athletes and people with muscle disease, creatine can help reduce the loss of muscle associated with aging, offering great potential to improve all-round quality of life. Mix one, 8 gram scoop with 6 to 8 ounces of cold water or other non-caffeine and non-acidic juices. Take one scoop before workout. On rest days continue to take one scoop in the morning. On hard training days take one scoop before workout and one scoop after second workout. Extreme Hydro-X for even better results.